The wedding season is just round the corner, which means the usual frenzy to throw the most elaborate and enviable wedding bash is palpable. The guest list is near completion, the wish list of venues chosen by the bride and groom are down to the top five, and the wedding feast is getting its final revisions. All that is left is to choose the perfect theme to set the tone and unique personality for your wedding. A lot goes into planning a wedding. Wedding Planners are often subjected to the fluctuating demands of the soon-to-be-weds and understandably so as they are plagued with pre-wedding jitters. Are you having a hard time making wedding day decisions? Take a deep breath and remain calm. Your wedding day will be one to remember for years to come. One of the important factors of your wedding reception is color scheme of the entire affair. For couples who are likely to experiment with color and wish to avoid the conventional route, the following list can prove to be helpful. 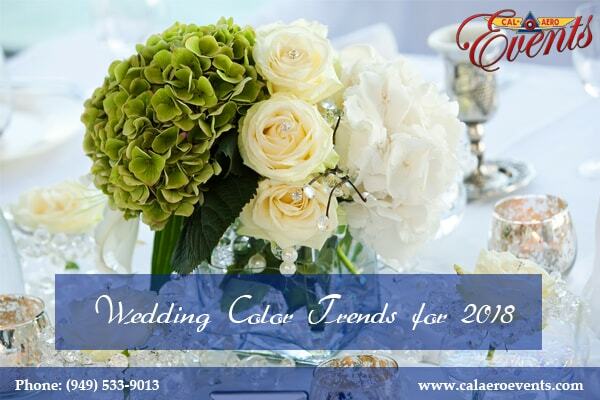 The wedding color trends for 2018 and beyond have grown diversely as more couples prefer unique color selections for their Big Day. Blue is here to stay and is not likely to go out of style anytime soon. There are multiple shades of blue to choose from and it is up to you to decide whether you are willing to incorporate the varied shades in every aspect of your wedding decor or just stick to a single shade. From powder blue, to azure blue, to sapphire blue, each of the shades of blue reflects a mood of happiness, freedom and opportunities. Gold defines timelessness. From coordinating the wedding dresses to the wedding cake in gold, you can rely on this timeless royal color combination. Gold comes in a number of shades and you might consider alternating between beautiful rose gold, white gold or go all out while decking the halls with an opulent shade that would reflect the glamor of your special event perfectly. Purple with its unique tone and its ability to work well with other shades is turning into a popular color for wedding parties. When used as a solitary color, deep purple delivers a playful, yet mysterious and upscale vibe. The various purple hues work well with whites, pinks, greens or even blues. Customize your invites, table napkins, festoons, curtains and more with the perfect complementary shade of purple. Mint is probably one of the hottest colors of the upcoming wedding season. This tone is refreshing and exquisite. Mint is a great shade to incorporate into the small details of a wedding, as it is not overpowering or “in your face.” Aside from opting for mint apparel, you can also consider customizing food items in this shade or use mint colored flowers as a backdrop. For more ideas on weddings, events and decor, you can visit Cal Aero Events and view our photo gallery of past wedding and events on our web site: www.calaeroevents.com.